The Ministry for Women would like to take this opportunity and e maumahara ana one of New Zealand’s most inspiring sporting greats, Tania Dalton. Tania died on 1 March 2017 aged 45 after suffering an internal carotid artery aneurysm. 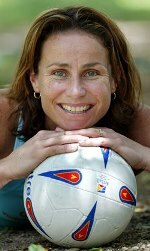 Tania was a world champion netballer, playing for the Silver Ferns from 1996 – 2007, with only a break in 2005 due to injury. She was part of the team that defeated Australia in the 2003 Netball World Championships - the only time Australia has lost the championships since 1987. She also competed at elite level domestically, having played for the Northern Force, Southern Sting, and Southern Steel. Following her retirement from professional netball, she became a netball commentator on Sky Sports. She is survived by her husband Duane, and three children: Charlie, Tayla and Matthew. Tania will remain an inspiration and role model for young Kiwi girls and women for many years to come.